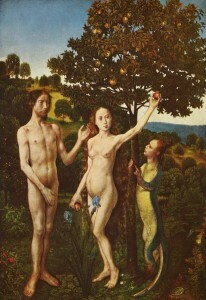 In the story, God sends three angels to fetch Lilith and bring her back to Adam, but she will have none of it. She refuses to return to a life where she is considered subordinate. The angels, named Senoy, Sansenoy, and Semangelof, warn her that God will kill 100 of her children every day that she does not return. Lilith becomes so enraged at their unjust request that she curses the angels and all of humanity, vowing that she will take revenge on any woman who would submit to such a status. This promise sets off hundreds of years of superstition surrounding pregnancy, childbirth, and the first weeks of human life, as instances of infant mortality and labor complications are attributed to the willful she-demon Lilith. Back at the Garden, Adam is given a new, more pliable companion named Eve. The angels have struck an uneasy détente with Lilith, who has agreed to spare the lives of women and children wearing an amulet that bears the names of the angels themselves. She does not fare as well in the deal, since God makes good on his promise to kill her children as punishment for her stubborn insistence on living an independent life. What price could be higher? And yet, she is compelled to live as her spirit demands. Anything else is not an option. Of course, as with all faith and folklore, Lilith’s story has roots and elements far older and more widespread than the common anecdotes like the one above. Long before she was designated as a mate for Adam, other cultures spoke of a wind demon or a night creature with a very similar name and modus operandi. The Canaanites called her Baalat. 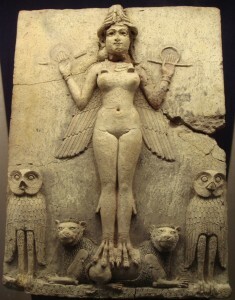 An ancient goddess of Sumer and Babylonia was named Belit-ili, or Belili. One ancient Ur tablet from around 2000 B.C.E. speaks of a goddess named Lillake. Even further back, the Sumerians of 4000 B.C.E. feared the Lilitu, a group of storm demons bearing diseases and death. It seems that as humanity has aged, we have added new layers to Lilith, layers which expand her reach and influence in our communal psyche. Not content to leave Lilith’s sins at disobedience and child-killing, ancient cultures also saw an opportunity to depict her as a creature of lust and wantonness. She and her succubae minions were said to catch men sleeping and seduce them in the hopes of breeding more demon offspring. She has been called the mother of all the plagues of the world, and some traditions depict her coming back to Eden and forcing sexual relations with either Adam or Cain, or both. Usually, these stories say that these liaisons produced several demon offspring who went on to breed more demon offspring, all of whom continue to trouble humanity to this day. Despite the severity of these charges, the Lilith persona has endured throughout history, garnering supporters as well as detractors. Some look upon her as a champion for the rights of the individual, or more specifically, for the rights of women. Others respect her rebellion as the difficult and lonely choice of true freedom. Robert Burns, in his poem “Adam, Lilith, and Eve,” empathizes with her, postulating that it was Lilith who truly loved Adam, rather than the submissive wife he preferred. So this is the complex character connoted in the element called Black Moon Lilith who appears on our astrology chart. How do we reconcile images of this wanton, child-killing she-devil with our current life and its evolutionary path? We will explore this question further in subsequent posts, as our conclusions may help to interpret our deepest emotions as well as our cultural beliefs. Get Your Own Astrology Charts Here! You Want to Learn Tarot?